Compliant with the latest British Helmet Safety Standards: BS7928:2013. Eye-Line Grille, with additional top bar, creates a greater surface area to the ball on impact, deflecting it away from the wearer's face. 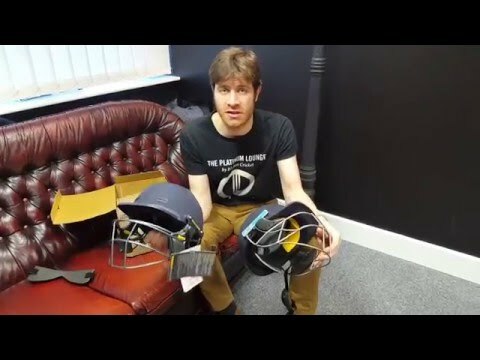 Halo Reinforcement System (HRS) extra strength helmet rim to protect the wearer against deliveries up to 90mph. Innovative 3-Layer Airflow System, with strategically placed vents in the inner and outer shells and air channels throughout the cavity, to keep the wearer cool. Titanium Elite Grille - almost 200g lighter than the steel grille Masuri helmets, with superior impact protection too. The Masuri Vision Series (VS) Elite Titanium Cricket Batting Helmet sets the standard for head protection and comfort, thanks to a strong, lightweight design. Featuring Masuri's revolutionary Eye-Line Grille, strategically placed airflow vents and a new Halo Reinforcement System (HRS) rim, the Masuri Vision Series (VS) Elite helmet provides superior vision, cooling and protection. The titanium grille allows the wearer a more comfortable feel as well as superior impact protection - the titanium grille helmet is nearly 200g lighter than the steel grille Masuri VS Elite Cricket helmets.